Motel 62 has new owners now, and they did not keep the computer system, so all of our reservations for ES14 have been lost to the winds. Motel 62 has new owners, and the old reservations have not been retained. This info just verified by Lopeha "Andy Williams"
I received a PM asking for more info on this event because of a total lack of info from this website. Facebook has ruined Forums.... because of the Smart Phone, and instant access to FB. but, Andy Williams 'Lopeha' and a couple of other guys decided that because it was so well attended by folks from Kansas, Oklahoma, Arkansas, Missouri and even farther out, like guys from Canada, eh?? , more him, than me, I am the cook and bottle washer. I try to make sure the flies stay off the hamburgers after they are cooked!! ES14 means "Eureka Springs" 14th year we have had this rally in the town of Eureka Springs, AR. I say "at least" because it might have been the 2nd year at Motel 62, because in 2005 we hosted NASSIR and some scurlywags from Ireland and the UK actually came of and attended. Pete Tice, Steve Saunders, "Wexy" Ciaran Meyer, Steve's son "Dillian", and a few more whom I can't recall right now... a truck hit me in 2008 and ruined my memory cells. Here I have uploaded all of the pertinent pictures that I could find. 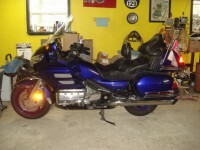 Motorcycle: 2002 GL1800; Have been to SD & WV on it along with all over Arkansas. Double Darkside & loving it! I will post all the pertinent information this weekend so folks can get the event on their schedules. If you woke up this morning don't complain, you woke up! The KanWing Rhino's & the Arkansas Ridgerunners would like to invite you to our 14th Annual Meet & Greet to held in Eureka Springs, AR over Labor Day weekend Aug 31- Sep 3, 2018. Our host Motel is the Motel 62 with a rate of $69 per night for a double queen room, the fancier rooms a bit more of course. Eureka Springs is in some of the most beautiful country around & has some of the best riding in the US (maybe even the world!). We will be preparing hamburger and hot dogs along with potato salad, macaroni salad & chips for a cost of $6 per person. We do this so you can relax and enjoy an adult beverage if you want after your day's ride without worrying about any unfortunate circumstances. For Saturday Dude's BBQ will be smoking beef & pork roast along with chicken on site for dinner. We will have BBQ beans, cole slaw & maybe something for the sweet tooth. Cost for this is $10 per person. We will have our annual auction to raise funds for the Jeanette Lawson Scholarship fund after dinner is finished (so start getting your auction items together). We hope you will join us a weekend of great riding & outstanding fellowship. Contact is Allison, she is ready to make your reservations. Information for T-shirts & pins will be coming later.